Not as bad as the other one? The rise of populist leaders and parties in many Western democracies has led to much hand-wringing over the fate of democracy itself. There may be grounds for concern, but it seems to me that another point, one which all sides might agree on, is being ignored. The quality of our leaders has gone into the toilet. The 2016 presidential election in the U.S. was a negative affair. What I mean is that it was decided by people who were voting not for but against a particular candidate. Donald Trump (after clearing out the entire leading rank of the Republican party, who proved to be imbeciles) and Hillary Clinton (who simply bought the Democratic party wholesale) entered the campaign with the highest negative poll ratings of any candidates in history. Neither one should have had any chance of winning. Unfortunately, one of them had to. I was reminded of this with the election of Doug Ford as head of the Ontario Progressive Conservative party heading into the upcoming provincial election. By any normal reckoning, or at any other time, I think this would be considered a disastrous choice. 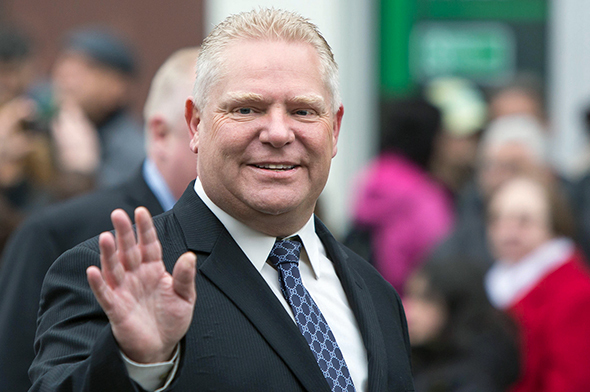 The supposedly smart Ford has the public persona of a loud-mouthed, ignorant boor. He is often compared to Donald Trump, and the comparisons are not all to his advantage. The idea of him being premier makes no sense. But opposing him is Kathleen Wynne, not just one of the most hated politicians in Canada but a thoroughly incompetent one as well. The only reason she is still in power is because her last opponent was Tim Hudak, who campaigned as an utter moron. Hudak was then replaced by Patrick Brown, who may be innocent of the charges of sexual harassment leveled against him but who still proved to be a complete idiot in thinking that he was going to come back and lead the party after they ran him out on a rail. What did we do to deserve this? How did politics reach the point where such creatures have risen to the highest offices in the land? Presumably the provincial election will play out along what are becoming disturbingly familiar lines: with citizens voting against the candidate they find the most reprehensible rather than for anyone or anything in particular. Something has clearly gone wrong with democracy. That doesn’t mean that it’s doomed, but it does mean that things are moving in a bad direction.